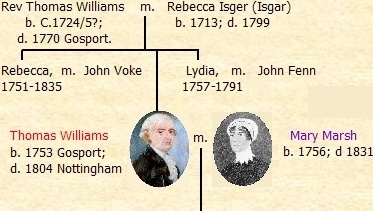 Williams - Early Family History and Origins of the Thomas Williams's of Gosport and Nottingham. To distinguish between persons with the same name below, colours are used. The Reverend Thomas Williams (1724/5 -1770) and his son Thomas Williams (1753 - 1804) are the forefathers of many descendants world-wide, the majority (over 5000) hailing from New Zealand. However, very little is known of the Rev. Thomas Williams and there is certainly no accurate knowledge of his family origins. 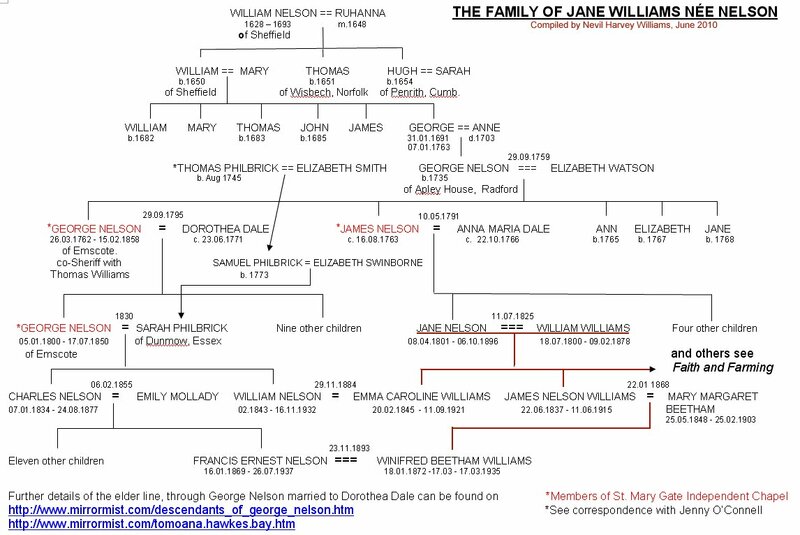 The results of many years of sincere research by family members have been compiled and written into an historical documentation, The Williams Family in The 18th and 19th Centuries in the UK by Nevil Harvey Williams. Nevil himself has spent some decades dedicated to researching the family in a very meticulous manner, and his work is the main article on this website. There are many other supporting documentation and research notes given here, in particular the transcription of recently acquired letters of Thomas. An exceedingly vast quantity of information is already documented on Henry and William, the two son's of Thomas who went to New Zealand as Missionaries, so very little of that is repeated in these pages. for a phrase ..."like this"
THE WILLIAMS FAMILY IN THE 18TH AND 19TH CENTURIES IN THE UK. An in depth article / story in several parts compiled by Nevil Harvey-Williams from his own and other genealogical research undertaken to date into the family in the Nottingham and Gosport areas. Introduction, Preamble, Search for the Welsh background of the Williams Family, Rev. Thomas Williams of Gosport,, Thomas and Mary Williams at Gosport. Thomas Williams and the family at Nottingham, The collapse of the business. Mary Williams (nee Marsh) at Southwell, The children of Thomas and Mary Williams, Catherine Heathcote, Southwell tailpiece. Abstracts of Letters Chosen to Augment the Story of Mary and Catherine's Lives in Southwell. These are VERY IMPORTANT letters - they are first-hand vindication of Thomas's life, and the family situation in part of the 18th century. If a descendant, he is most likely your 4th, 5th or even 6th great grandfather! 1794 Letters 1, 2 & 3 Letters from Thomas to his wife Mary at their home in Gosport. They cover his arrival at Nottingham to establish a new home there, family, friends, and various connections to the British Navy. 1794 Letters 4, 5 & 6 Continuation of above sequence - includes letter to young son Sydney. 1803 Sequence Five letters, again written to Mary in Nottingham, while he is on a business trip. HOSIERY A brief history on Hosiery and Lacemaking in Nottingham relevant to Thomas's letters and the 18th & 19th Century Williams History below. (Thomas became a hosier). 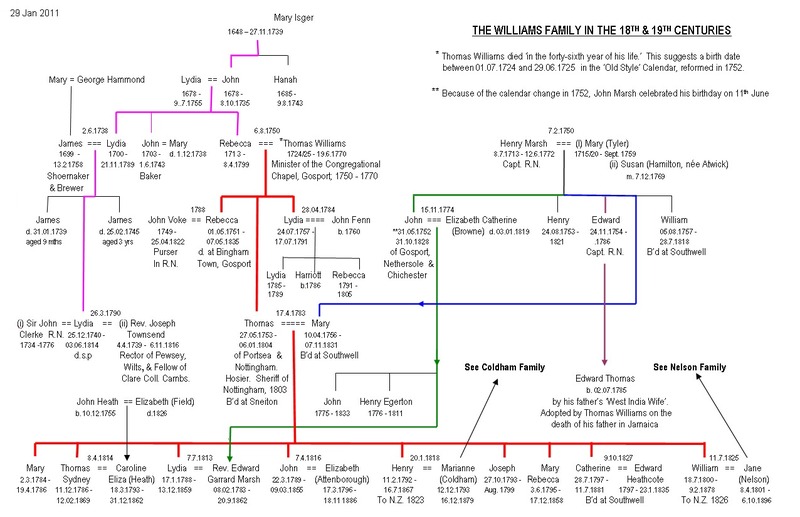 EARLY WILLIAMS FAMILY: A tree showing Thomas and Mary with the Isger / Marsh connections, and their children with spouses. View as a pdf file or as a jpg image . THOMAS SYDNEY WILLIAMS: The eldest son of Thomas. The tree gives several lines of descent. View as either a .pdf file or jpg image. The children and grandchildren of Thomas Sydney Williams giving spouses, dates and some information to help those interested, and includes the 'tooth' letters of Tom. 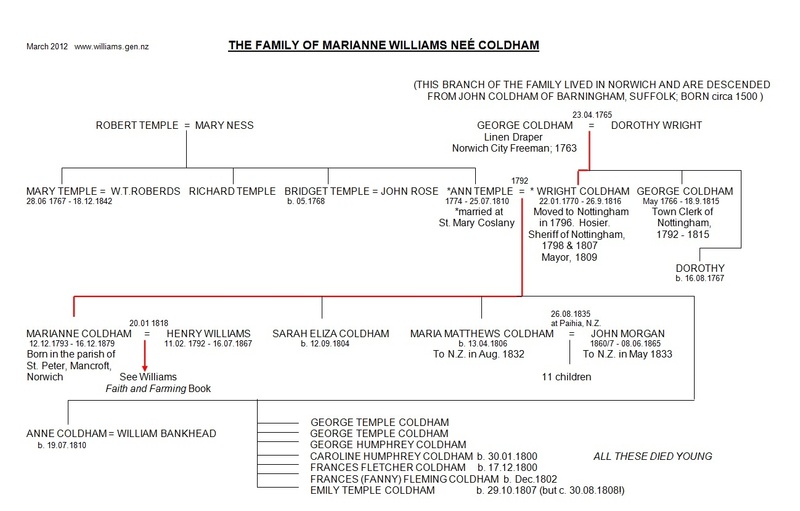 THE NELSON FAMILY: There is a very strong Williams family connection with the Nelson's dating at least back to the Sherriff of Nottingham days of Thomas Williams, whose son William Williams married Jane Nelson, niece of a co-sherriff of Thomas's. Both a daughter and grand-daughter of William and his wife Jane (nee. Nelson) also married into the same Nelson family. The backbone of the livestock farming and meat industry development of the East Coast, North Island of New Zealand was to a large extent due to the stock and station firm of Williams and Kettle Ltd, begun by F.W. Williams, and the meat processing company the Tomoana Freezing Works begun by William Nelson, an uncle by marriage to F.W.W. and a 1st cousin (once removed) to Jane The tree is viewed as either a pdf file or as an image and shows the grandparents and parents of Jane and the connections mentioned above. ON WIKITRE: THE IMMEDIATE DESCENDANTS OF THOMAS (1753-1804). Wikitree allows only one profile of an individual. Their aim is to build one world-wide tree as much as possible. It is a free site to join (and then most or all advertising disappears and other features are available) and a member is able (with permission) to add, edit, manage, etc. profiles if they have authentic information. To build a sound-as-possible base for the family on Wikitree, basic information of three or four generations of Thomas Williams (1753 - 1804) descendants were added from the Evagean Publishing Faith and Farming book, and other sources. Other Wikitree members have added more descendant profiles, linked to other families, edited errors and even added DNA results. If you are keen or serious about adding to the effort, please join up with Wikitree , or otherwise Email Gary if you wish details on a profile added or changed, or you wish to be sent an email from your profile or Wikitree to join. Some further details on the Rev. Thomas Williams of Gosport and of his children and grandchildren. And a request for more information. Names of Researchers A list of some of those involved with the Williams family research during the past century. Names of Ancestors List of earlier ancestors by surname given on this website, with tree or page references. 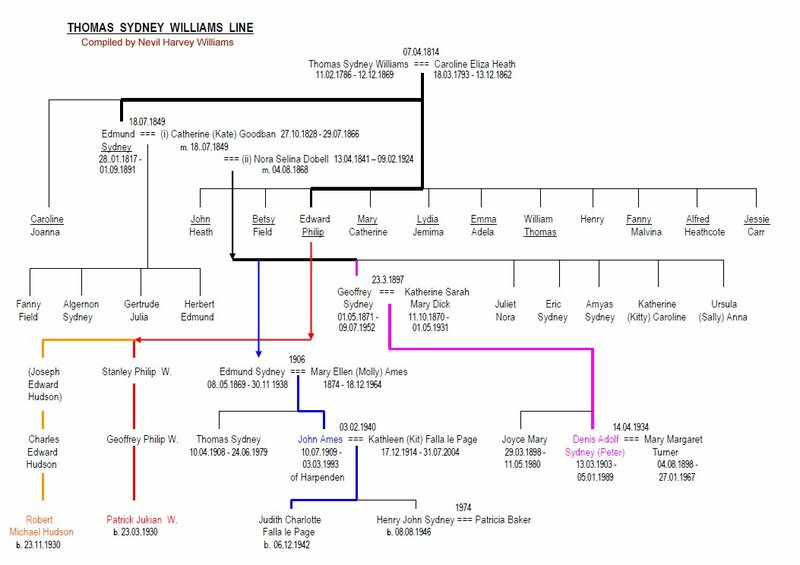 Edmund Sydney Williams 1817 - 1891 This makes very interesting reading , particularly for Thomas Sydney Williams descendants, and covers his family while living in UK and at Altona and Hamburg in Germany. 'Early Memories And After' written by Fred W Williams (1854-1940) for his sons. Pertains to Paihia, Gisborne and Napier, N.Z. areas. F.W.W. is the grandson of William Williams and was founder of Williams & Kettle Stock & Station Agency, Mayor of Napier etc. C.M.S. History Extracts pertaining to New Zealand from the 'History of The Church Missionary Society.' These few chapters give a good understanding of the enormity of the role that Henry and William Williams played in the shaping of New Zealand. Waitangi.com New Zealand history, in which Henry and William are prominent, expressed from a more complete perspective than what is orthodox. Williams Historic House: The Retreat was built at Pakaraka, Northland, for Henry Williams in 1851 or 1852. This is now owned on by the Henry and William Williams Memorial Museum Trust. Christianity Among The New Zealanders Interesting reading, giving a good account of the Williams brothers involvement in early New Zealand. By William Williams, D. C. L. Bishop of Waiapu.